A leading girl group stormed their way to back-to-back crowns. Other than one other girl group, the remaining male groups and artists were left to fight for respectable scores. The chart is divided into three different categories: Gaon Digital Score (60%), Hanteo Physical Sales (15%), and OH User Voting (25%). 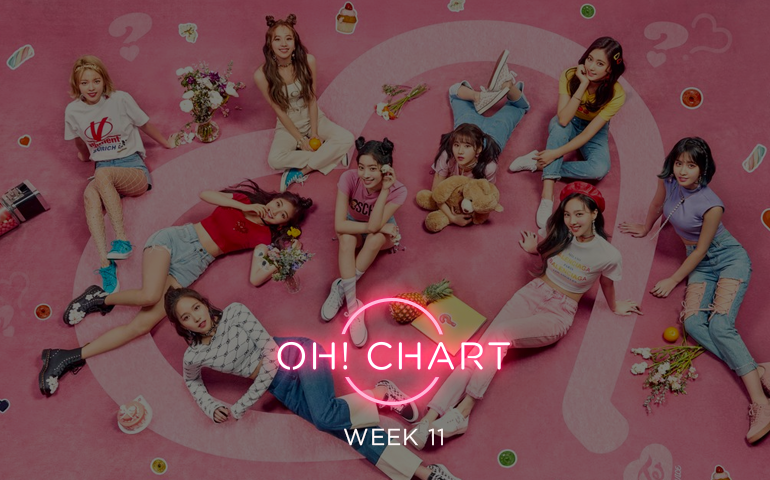 OH users are allowed to vote and have a say in the overall chart ranks of certain songs each week. OH users can vote for more than one nominee but cannot vote for the same nominee more than once. Every week, data from the three categories will be gathered and weighted accordingly. The artists with the highest scores will make it onto the chart. If an artist wins a triple crown, their results will not be recorded in future charts. JYP Entertainment’s thriving girl group TWICE has taken out back-to-back OH! Chart crowns with “What is Love?” on 17.78 points. Sub unit EXO-CBX came runner-up for “Blooming Day” on 9.39 points. Soloist Nilo wrapped up the podium with “Pass By” on 8.95 points. In the physicals category, EXO-CBX demolished the competition after they sold 63,093 copies. Fellow boy group VIXX finished second on their return to the OH! Chart on 34,338 copies. Back-to-back winners TWICE finished third on 23,578 copies. Nilo won first place for the digitals with 50,883,935 hits. TWICE took out second spot on 48,078,571 hits. Rapper HAON came third for his smash hit, “Dongbang” featuring Sik-K and produced by GroovyRoom, recording 46,799,226 hits. TWICE dominated the OH! category after polling 53 votes. Mamamoo and EXO-CBX tied for second on 23 votes. BIGBANG wrapped up the top three with 19 votes. Leading girl group TWICE’s latest smash hit, “What is Love?” is a sweet and heart-fluttery track. It follows the classic up-beat, pop concept that the girls treat like their bread and butter. From the cute vocals, addictive tune in the chorus and movie references, the MV and song will get you buzzing and dancing along. Overall, it is yet another marketable and incredibly adorable release from TWICE who are steadily rising up in popularity. Can TWICE notch another triple crown go? Will rappers join the podium? Or will a new debutant pull a surprise stake? Or will rappers finally push for podium spots? Let us know your thoughts below!